I'll start with the new first. :) This is Shades of Gold, the first in a series of twelve shaded designs featuring bands and motifs shaped in to geometric patterns. 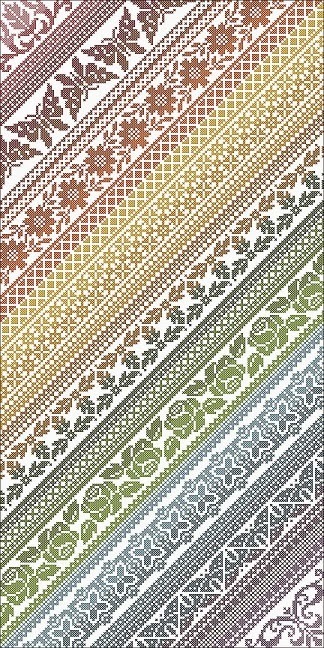 Each design uses 2-3 shades of the same colour and is stitched on a coordinating fabric. 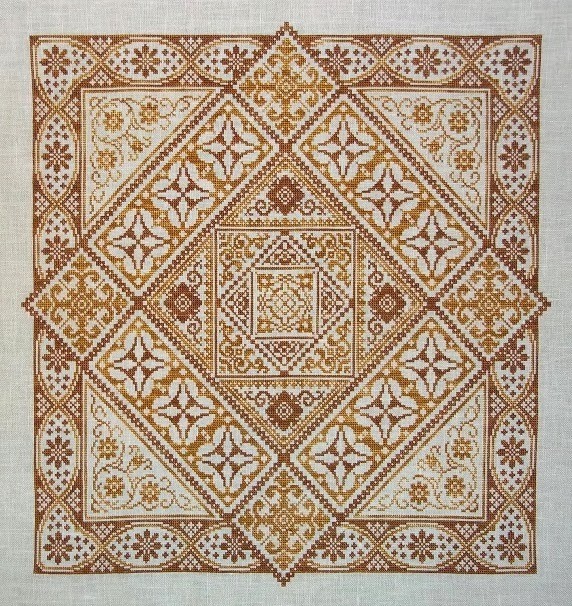 Shades of Gold is stitched with Gloriana Florimell on 40ct French Vanilla linen from Sassy's Fabbys. The series started out as just this one design, but while sketching the layout for it last summer I came up with ideas for several other layouts, then while picking out colour schemes, found several other colours I wanted to use so had to come up with more layouts... and on it went. ;) I hope to be able to release these one every 2-3 months. The retail price for each one will be $16. The cross stitch only version is available only as a PDF - it's too hard to juggle two different versions in print - and is up in my Etsy shop now - or you can email me to order. The price on it is $12 as it's significantly less pages of instruction than the original design. I'm sending out part 7 of The Learning Sampler in a moment, if you don't receive yours, please let me know!